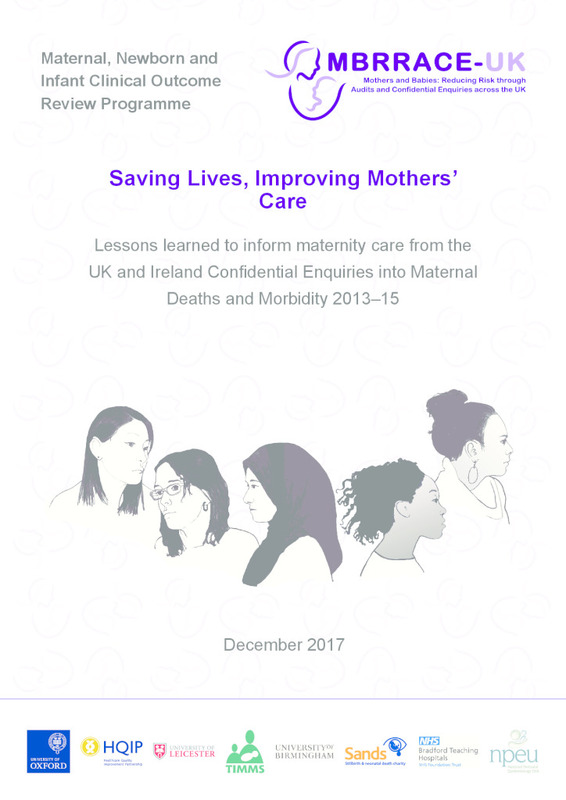 This report, the fourth MBRRACE-UK annual report of the Confidential Enquiry into Maternal Deaths and Morbidity, includes surveillance data on women who died during or up to one year after pregnancy between 2013 and 2015 in the UK. In addition, it also includes Confidential Enquiries into the care of women who died between 2013 and 2015 in the UK and Republic of Ireland from neurological conditions, other medical and surgical conditions, sepsis, anaesthetic complications, haemorrhage and amniotic fluid embolism, as well as Confidential Enquiries into the care of women with morbidity due to uncontrolled epilepsy in pregnancy and those with severe postpartum mental illness. Surveillance information is included for 556 women who died during or up to one year after the end of pregnancy between 2013 and 2015. The care of 124 women who died and 46 with severe morbidity was reviewed in depth for the Confidential Enquiry chapters. Full report, lay report and accompanying infographics are available to download from this page.